Pixhawk ® 4 – by Dronecode members Holybro & Auterion. As announced earlier this year, Pixhawk 4 is now available for purchase directly through our member Holybro, in both plastic and aluminum case versions. 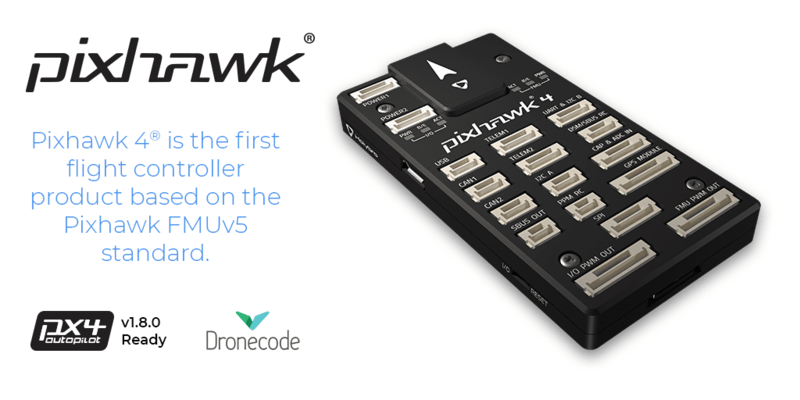 Pixhawk 4 is the latest update to the Pixhawk family of flight controllers and the first based on the FMUv5 standard. Read more about the Pixhawk 4® at the Pixhawk.org blog. Pixhawk 4® ships with PX4 v1.8 pre-installed, this PX4 version features VIO, Obstacle Avoidance as well as many performance improvements. Other flight controller products coming soon based on the Pixhawk FMUv5 standard that will also run PX4 v1.8 include Pixhawk 4 mini (by Holybro) and the Pixhack v5 (by CUAV). Read more on the PX4 v1.8.0 release here. The new Pixhawk.org is a single placeholder for everything Pixhawk, from standards, news, to docs. Visit pixhawk.org and let us know what you think. The team is looking for use cases and user stories to share with the community, if you would like to participate in a guest blog for either Pixhawk.org or Dronecode.org, please share your story on our discussion forum. Supporting this launch, our member Arm has a new “Autonomous Robot Challenge” with Hackster.io where they feature Pixhawk 4® as a valid platform for the challenge.